The Beatles Are Coming! PEOPLE Celebrates the 55th Anniversary of the Fab Four's First US Visit . Beatles Radio: The Beatles, Solos, Covers, Birthdays, News The Fab 4 and More! Nearly 55 years after the Beatles landed at New York City’s John F. Kennedy Airport on Feb. 7, 1964, PEOPLE is taking a look back at the love affair between a band and a country in an updated Celebrating Beatlemania! The Beatles special issue. “Thanks to generations of new fans joining the still-devout baby boomer Beatlemaniacs, the band is bigger now than it was during the Beatles’ meteoric decade-long career,” writes American Theater magazine editor Rob Weinert-Kendt in the foreword. 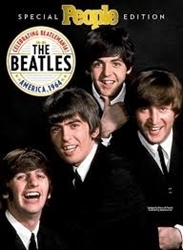 The 96-page special edition is filled with scenes from the band’s early years, from their debut appearance on The Ed Sullivan Show (that 75 million Americans tuned in to watch!) to the mass hysteria that ensued during their 1965 show at Shea Stadium. Read about John Lennon, Paul McCartney, George Harrison, and Ringo Starr‘s early lives and how they each began their musical careers.